Is food your enemy? You may not consciously realize it, but if you see food as your enemy, your body tends to take on all of that negative banter, with a constant battle going on between your mind and what you should, or shouldn’t, be eating. It manifests itself into stress, resulting in an inability to function as it should, not to mention creating a very unhealthy mindset that wreaks havoc on your mental well-being too. An unhealthy relationship with food often begins in the teen years, with all of that pressure to look a certain way, fitting into skinny jeans with a sleek, lean physique. Is there a moment in your life you can look back on that has defined your relationship with food? Perhaps it all started when you made the decision that you’d do anything you could to stay thin. You might have starved yourself, loading up on diet sodas, caffeine and anything with as few calories as possible. Butter? Cheese? Never! You’d never let it touch your tongue – if you did, all of your efforts would be for nothing as the pounds would pile on and you’d never squeeze into those jeans or be able to zip up that perfect prom dress. It’s not exactly an enjoyable way to live, and many people continue this pattern for years, if not decades. But it really shouldn’t be much of a surprise considering that on a daily basis we’re bombarded with images that tell us we’re only worthy if we’re thin. There are endless headlines based on losing weight and so many seemingly perfect bodies in all of those magazine ads, on TV, and in films. It’s incredibly easy in our modern times to develop an unhealthy relationship with eating, which is why so many of us struggle with food issues. 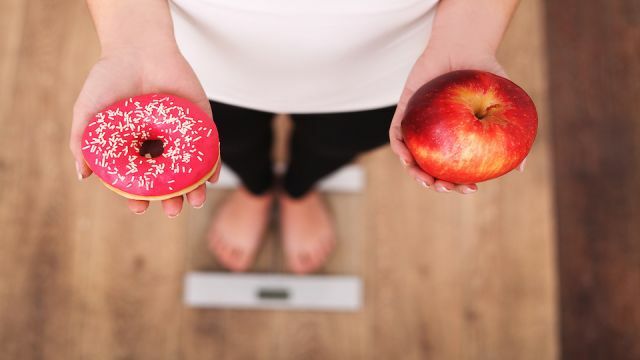 Some people, perhaps even you, think about food almost all of the time – such as what and when you’ll eat next, how healthy your overall diet really is, and whether or not what you’re eating will help you lose pounds. Your life may be constantly interrupted with thoughts of food, preventing the enjoyment of eating, causing you to avoid certain social situations, and sometimes even interfering with your health. This can be taken to the extreme, and often is, developing into eating disorders like bulimia and anorexia. If that’s the case, it’s important to get seek professional help as these are serious illnesses. The National Association of Anorexia Nervosa reports that at least 30 million people in the U.S. of all ages and genders suffer from an eating disorder, and every 62 minutes, at least one person dies as a direct result. In fact, according to the National Institute of Mental Health, anorexia nervosa has an estimated mortality rate of around 10 percent which is 12 times higher than the death rate of all causes of death for females between the ages of 15 and 24. Even if you’re not suffering from an eating disorder, if you have an unhealthy relationship with food, you aren’t getting the most out of your life, and it may even cause you to gain weight, not to mention harming your health, physically and mentally. To start retraining your brain for food, you might want to ask yourself the reasons for your belief that certain foods, or fat, are so bad. Who taught you that and when did it begin? While the answers to those questions aren’t particularly important, it may help you realize that it’s really not about food, calories and fat, it’s the idea: “I must be thin at all costs,” for example, that you adopted years ago, giving up loving yourself and your body. The idea becomes manifested in our physical reality based on those thoughts. It’s black and white: one perspective means approval, while the other equals shame. Of course, for many of us, despite good intentions, it’s just not all that simple, but there are steps you can take that will make this life transformation easier. After eating something unhealthy, do you tell yourself that you have to work it off? For example, “I just ate three pieces of pizza, so I HAVE to go burn all of those calories.” That means that when you’re working out, you’re doing it because you’re shaming yourself, not as a way to relieve stress, or to keep your body fit and healthy. This is negative mind clutter, which creates stress, one of the worst things you can do for your health. It doesn’t serve you well in any shape or form and won’t help you stay motivated for the long haul either. You don’t need to “punish yourself” with exercise for eating or exercise to earn your food. You can’t change things if you overindulged, simply move on and do something more positive and productive. Mindless eating can be overcome with practice. While it takes some effort to develop the habit, if you’re committed it will become easier, and you’ll learn not only to enjoy food more, but you’ll naturally eat less too. Pay attention to your food, eating slowly, savoring each bite. Slowing down allows the mind and body to communicate what we really need in the way of nutrition. Your body sends a satiation signal about 20 minutes after the brain, which is why unconsciously overeating is common. When we slow down, we give our body the chance to catch up to our brain so that we can hear those signals and eat just what we need to eat. Listening to your body, instead of your mind can help you determine whether you’re actually hungry or just trying to feed an emotion such as boredom, loneliness, sadness, stress and so on. Mindful eating means listening to your body’s hunger signals. Learn what they are, and what your emotional hunger triggers are as well. Try to taste and identify all the various ingredients in your meal, which helps you to focus on the present moment and eat more mindfully. This can actually become a fun game when you’re dining out or didn’t make the food yourself, and it might even boost your creativity in the kitchen. Eat in silence, focusing only on your food, not on the television, your laptop or your phone. If you’re distracted by anything outside of this experience, it makes mindful eating more challenging. If it’s too difficult at first, try designating just the first five minutes to eat in silence. Become more connected to your food and where it came from by considering its lifecycle. Unless you’re a farmer or a hunter, you’re probably disconnected from your food, and rarely consider where it came from beyond what the packaging tells you. But by truly thinking about how that food got onto your plate, from the person who planted and harvested the raw ingredients, to the person who stocked the grocery store shelf and the one who prepared it, will help you reconnect to the natural world, allowing you to become more mindful of what you’re eating. Banning foods from your diet, also makes you crave them more. Think the old, tried-and-true instead: everything in moderation. That slice of chocolate cake is just cake; it’s not a moral conundrum you need to resolve. If you want it, savor every bite instead of vilifying it, and you will more likely be able to enjoy it in moderation. If you have an unhealthy relationship with food, you’ve probably lied to yourself about it multiple times. For example, you decided to go on a juice fast, telling yourself you wanted to flood your body with antioxidants, but that really has nothing to do with it. You want to be thinner. Food restriction almost always stems from the dissatisfaction of what you see in the mirror. While there isn’t anything wrong with wanting to be thin, there is a problem with depriving yourself of the essential nutrients your body needs, whether it’s via a fast, cleanse, cutting out entire food groups, and so on, pretending that it’s all to enhance your health. That’s a dangerous game that often backfires, creating a vicious cycle of starving, binging and hating yourself, and then doing it all over again. It probably won’t help you lose weight either, in fact, the opposite is often true, as it causes our metabolism to get out of whack. When you’re kinder to yourself and feed your body with the nutrients it needs, you’re more likely to eat healthier and maintain a healthier weight naturally. Never sacrifice your happiness and well-being for the need to be thin. While you may always have that desire, just like you do for that shiny new car, eventually, it will become less important. If you don’t allow yourself to enjoy eating truly, you’ll probably never have a healthy relationship with food. Meals take time; they shouldn’t be scarfed down in between other responsibilities as if they’re not important to your health and well-being. When you schedule out your day, be sure to include appropriate time for eating, not just five minutes. While it may put food in your belly, it won’t truly nourish you. There’s no need to feel guilty about cutting time from something else to make time to eat – believe you are worth taking the time to sit down and enjoy every bite of your meal. Instead of focusing on how your body looks, pay close attention to how it functions. It’s important to move on from hating your body and learning to grateful what it does for you. If it’s challenging, begin by being grateful for certain parts of your body and what they allow you to do. Eventually, work toward at least acceptance of the parts you aren’t crazy about too. Hey Buddy!, I found this information for you: "These Words Can Help You Get Off the Diet SeeSaw Once and For All". Here is the website link: https://www.thealternativedaily.com/words-get-off-diet-seesaw-once-for-all/. Thank you.